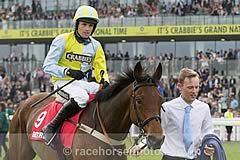 It is almost two years since Lucinda Russell’s One For Arthur became only the second Scottish-trained winner of the world’s most famous steeplechase, and he made an inauspicious return from a lengthy absence when unseating Tom Scudamore at the third fence back at Aintree last month. Reunited with his Grand National partner Derek Fox, the 10-year-old at least made it further on this occasion, but was struggling to keep tabs on the leaders from an early stage before eventually parting company with his rider four fences from home. Russell said: “He’s still a little bit rusty and did go a bit left at his fences, so we’ll have to sort that out. “I don’t know if he’s feeling something – we’ll have to get him checked out. At the business end of proceedings, it was 6-1 shot Wakanda who came out on top – providing trainer Sue Smith with a fourth victory in the race following the previous triumphs of The Last Fling (2000), Artic Jack (2004) and Cloudy Too (2016). The 10-year-old jumped and travelled with elan in the hands of Danny Cook, and knuckled down well from the final fence to prevail by a length and three-quarters from Robinsfirth. Cook said: “He’s a very good stayer who jumps great and travelled great today. First run in 1981, the Peter Marsh Chase has sometimes been used as a springboard to a tilt at the Aintree Grand National later on in the season. It can attract some of the leading staying handicap chasers from the UK & Ireland and the winner of the race is normally a horse to keep an eye on. Cloudy Lane was an emphatic winner of the 2009 renewal, whilst Our Vic defied his years by winning the contest in 2010 for David Pipe at the tender age of 12.